Hot tubs and spa pools are becoming ever more popular. They present an attractive way to enjoy a dip in some refreshing water. But is that water as refreshing as you think it is? It may look inviting, but it is far from uncommon for people to experience health issues including infections and skin problems after using one. So, what are the health risks from using hot tubs and is contaminated water the issue? In fact, one survey conducted across America in 2013 discovered one in eight venues out of 49,000 sites had to be immediately shut because the danger to health was so pronounced. So much for a relaxing stint in a hot tub. Hot tub water – is it share and share alike? 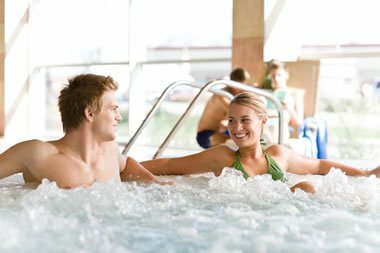 Many people assume the water in a spa pool and hot tub is hot enough to kill most of the bacteria that find their way into them. Not so. Typical water temperatures often provide the exact opposite scenario – an ideal breeding ground for bacteria of all kinds to grow including some potentially dangerous ones such as legionella and pseudomonas. You could conceivably get into a hot tub and sit in a bacterial pool that has been created over the course of several weeks. Not ideal – and not what most people think of when inspired to enjoy a relaxing dip in a hot tub. Everyone entering the pool will contribute bacteria to the hot tub when they get in – even if they believe they are clean when climbing into it. You cannot see the bacteria, but it lives on us all. Hot tubs are treated in a similar manner to swimming pools. However, while lots of people share pools, the volume of water and the space it occupies is much larger. That means while bacteria will be present, the chlorine the pool is treated with should kill most of it off. Compare this with the much smaller space a hot tub uses. If lots of people use a hot tub in a short time, cleaning it and treating the pool water becomes much harder. The heat of the water is also a problem as it makes it harder for the disinfectants to do their job. That means more frequent cleaning and more frequent treatments. In the USA the Centers for Disease Control (CDC) recommends the pool water should be checked every hour if the hot tub is experiencing heavy use. If you’re about to use one and you haven’t seen such checks made in the last hour or so, you may wish to reconsider. In the UK, if you’re a business and operate a spa pool or hot tub the Health & Safety Executive say you must carry out a legionella risk assessment and then implement control measures to keep pool users, staff and others safe from harm. Hot tub folliculitis is arguably one of the less-serious things you could develop after a session in a hot tub. It appears as a rash, it can leave permanent scars, and there is no real treatment for it either. Legionella bacteria can contaminate poorly managed and dirty hot tubs. If this happens serious health issues can arise as it can lead to Legionnaires’ disease, a potentially fatal lung infection. All of which may make you reconsider the next time you think about getting in a hot tub. Are Garden Water Butts Contaminated with Legionella Bacteria?